Отсылка к "Песни Льда и Огня" Джорджа Мартина. "Суровая северная природа выковывает характер грубых и закаленных людей, которые называют себя железнорожденными. Как и викинги, многие из них – опытные воины и мореплаватели, живущие грабежом портов и городов вдоль всего западного побережья Вестероса. Они называют это «платить железную цену»." руда в количестве 3 штук висит на потолке. рейду лучше разделиться на 2. босс танкутся почти у стены. игроки, которые кликают по руде должны находится под рудой. но следует учесть, что игрока откинет чуть назад. остается только подгадать. Достижение выполняется ДАЖЕ если человек, взявший руду, погибает в течение боя. Босса отводили прямо ко входу - этого расстояния хватает, чтобы набрать нужную высоту с подбрасывания. Весь рейд выстраивался в линию друг за другом под тем местом, где находится руда. Подлетали, соответственно все вместе и кому-то обязательно везло с рудой. Такой способ уменьшает количество попыток из серии: "надо немного отойти назад/вперед", поскольку все такие вероятные места кем-то да заняты. К тому же таким образом волна с большей вероятностью попадет в нужное место, если почти все её цели находятся там (остаются только танки, которые у нас ловили удар от босса). на 27\07\18 ачив не делается в мифике. В составе из 8 игроков сделали 6 траев, босс просто не использует Удар с размаха вообще, либо иногда 1 раз за фазу ( максимум ловили 2 раза за бой). В хм сделали с 1 трая, не повторяйте нашей ошибки. Всем спехов с получением ачивы. The iron price is a concept in the culture of the ironborn, and their local religion of the Drowned God. Paying the iron price means seizing something from those one has defeated rather than paying or treating for it. Thus, it is a primary aspect of the "Old Way", the traditional lifestyle of the ironborn. The opposite of the iron price is "the gold price" - paying for possessions - which is considered shameful for a man to pay. Upon entering the room where Gruul is, pan your camera towards the ceiling. In a small triangle formation around the center ring of the ceiling, there are three clickable ores. These are the Pristine True Iron Ores you need to collect for the achievement. Of course, they're all the way up there and we have no way of flying, so how do you get them? Simple, get a lift from Gruul...specifically, his overhead smash ability. You have to have enough health or mitigation active to be hit head on by it and get knocked up into the air, just high enough to where you can click one of those ores to pick them up at the peak of your trajectory. They're far apart enough, however, that you'll need to do this three times separately over the course of the fight. Once all three have been grabbed from the ceiling after smash-jumps, you're free to kill the boss. Just make sure that whoever clicked on those ores stays alive to the end, that's likely part of the requirement (we didn't get a chance to actually test this as it was discovered during mythic testing). In my attempts to get up there while tanking Gruul I noticed that I simply wasn't flying quite as high as the others in my raid when hit by the overhead smash, so either tanks are prohibited from doing this achievement for their raid or there is some user error on my part. As Lucivero said, we were misunderstanding how the knock-ups work. The farther, the higher. Position the boss at the entrance, you can get two ores from there (the farthest ones). Move the boss to the opposite side for the third one. Don't move it too far though, or the boss will throw the player too fast and it will be harder to click on the ores. Put a mark where your raid should stand before the Удар с размаха (it targets a random raid member) so the ability is casted just below an ore. The ability has no specific timer and seems to share CD with Удар окаменения (so if the boss casts Petrifying, don't expect a Smash before the cleave). Stack when it's safe after Инфернальный удар, and move back to the two group positioning before the boss reaches 100 energy. Fall damage can easily kill you, someone who can avoid or mitigate fall damage is more useful. If you are a mage, I found better to cast slow fall before the smash. Does anyone know if the whole raid gets the achievement if one person collects all three? What if seperate people get one ore each? Completed this with the guild. Check where the ores are located on the ceiling and tank the boss as far away as possible so the smash attack throws you into the air. Ask a mage for slowfall so removing the fall damage! If you have a decent hunter in your raid group you can obtain all 3 ores from having the boss at the entrance. We had the boss at the entrance and a marker in the center of the room for assigned groups to stack when it was their turn. We split the raid into two groups and rotated them on the marker every 2 Inferno Slices, it was ideal to split the groups evenly between classes that had ways to avoid fall damage as this was probably our biggest problem. 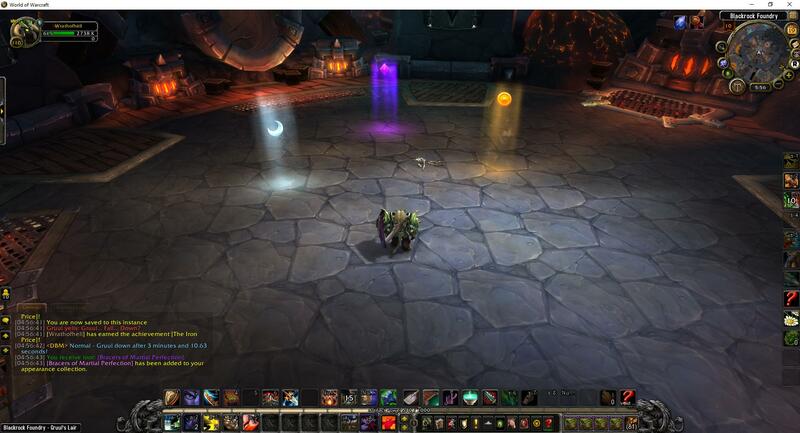 Idea classes for going up were Hunters, Warlocks, Paladins and priests with our raid comp. The damage done by the slam on Normal Difficulty was negligible and not something a shield etc couldn't handle. As for the closest ore to the boss, you do require a hunter to disengage in that direction and it can be quite difficult, we found going into first person view before you got knocked up to be ideal as the camera tends to go a little mental as you reach the roof. The people who click the ore do NOT need to be alive when the boss dies for the achievement to pop. Solo'd as a prot warrior after a bit of practice, I recommend setting up world markers under the ores so you have a good idea on where to stand. http://i.imgur.com/EsNTFM3.jpg This is where I placed them and successfully obtained all 3. Seems to be broken in 7.2. Gruul will no longer cast Overhead Smash, except during Destructive Rampage, and there's no way to reach the nodes during Rampage. So, i have tried to do this on my Rogue on Mythic, but everytime he casted Overhead Smash, he went back in to the middle of the room and the knockback where i should have stood (and i was standing there) was tiny. I don't know if it's because of the difficulty or it was patched, but i tried it several times. This achievement is not soloable at the moment unless you have a pet class like a mage, hunter, or warlock. He will not do Overhead Smash if you are solo, so bring a friend! 1) Normal Difficulty. This took me a few tries. The toughest part of this fight is angling yourself so you get a good clean jump towards each Pristine Ore.
2) You will see the Pristine Iron Ores at the top of the ceiling, there are three of them you must acquire during the fight. 4) Spin him around so he is facing towards the Pristine Iron Ores. 5) Stand close to him, putting yourself in between Gruul and the Ore, but don't move closer to the ore until he begins his Overhead Smash. And don't move closer to the ores so that Gruul starts moving towards the middle. All you want to do is just stand between Gruul and the center of the room. 6) Once Gruul begins Overhead Smash move closer to the ore/center, and you'll notice Gruul stays in the same position during his cast. The further you are away from Gruul, the higher you will jump into the air. 7) This will take practice to find the right spot to take off from, but try it a few times and you will get it. 8) While flying through the air, and high enough, grab a Pristine Ore. Spam that right mouse button as you get in range. Rinse and repeat 2 more times for the others. After heading back to the ground, simply run to the edge of the room again, and spin Gruul around so he's facing the center. Wait for the next Overhead Smash. 10) If Gruul starts devastating rampage, just stay out of the overhead smash zone and keep running around until that phase is over, then it's back to normal. 11) Once all 3 Pristine Iron Ores are acquired, nuke Gruul. I just soloed this on my rogue (on heroic). It was pretty easy, as you take less fall damage as a rogue, I used a Crimson Vial to heal but it wasn't really necessary. My biggest problem was finding the right position in the ground, as you can't put markers on the ground anymore (at least for me, the raid control didn't show up). I moved him to the door and made him face the center of the room. Once he started to cast overhead smash, I moved the camera all the way up and started running towards the first ore (don't Sprint or you risk not ending up in the right spot). By the time he finished the cast, I was in the right position do get the ore. Then again moved him to the door (a bit closer to center this time) and repeated the process to get the second and third ore. If you can bring someone to get raid marks, this should get a lot easier! Соберите 3 куска беспримесной истинной железной руды, а затем победите Груула в литейной клана Черной горы в обычном или более сложном режиме.